True to form, this Cornbread, Chorizo, Poblano Stuffing was my favorite part of our Latin Thanksgiving menu. It hit all the right notes – just a little bit sweet from the cornbread, savory and salty from the chorizo, spicy from the roasted poblano, and a bit herbaceous from the oregano and sage. Part of the beauty of Thanksgiving is that you can fill your plate up with small amounts of many different dishes, going back for seconds as many times as you want. It’s a feast with many choices. But if you could only choose one thing to eat on Thanksgiving, what would it be? 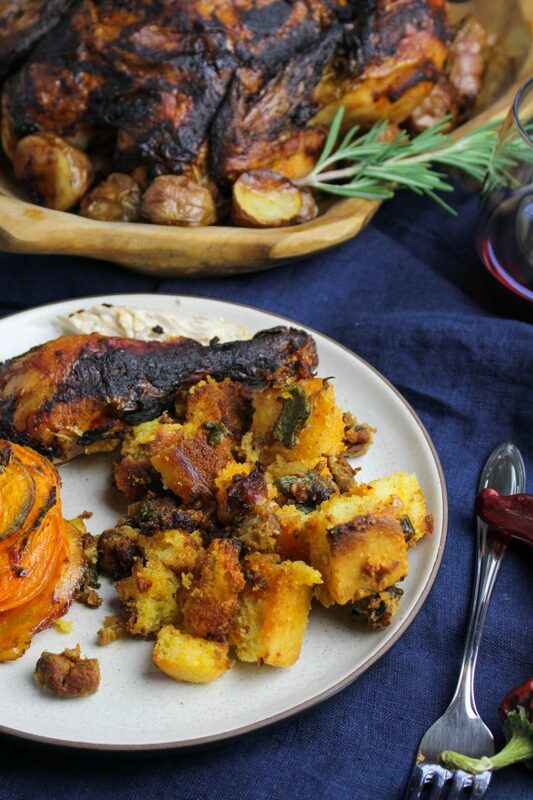 For me, I think it would be stuffing, especially this Cornbread, Chorizo, Poblano Stuffing. I mean, what’s not to like about toasted bread mixed with sausage and veggies and a copious amount of butter and then served as a reasonable addition to a holiday meal? In my opinion, nothing. 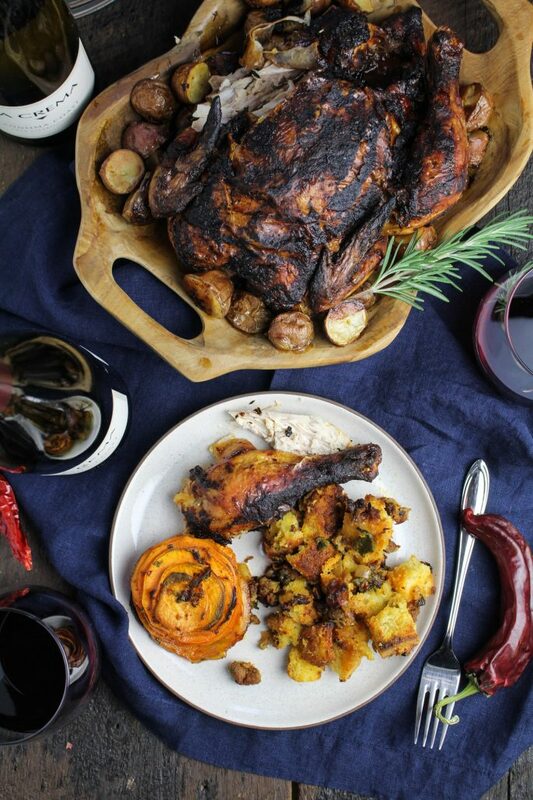 Sure, it’s a little more work to prepare than your boxed stuffing mix, but it’s so worth it. If you have any leftovers, I even think it has enough flavor to stand as a meal on its own–perhaps with a fried egg on top, or mixed into a bowl of pumpkin bisque (try it, I can promise you it’s delicious). It really upped the ante for what I consider to be great stuffing. 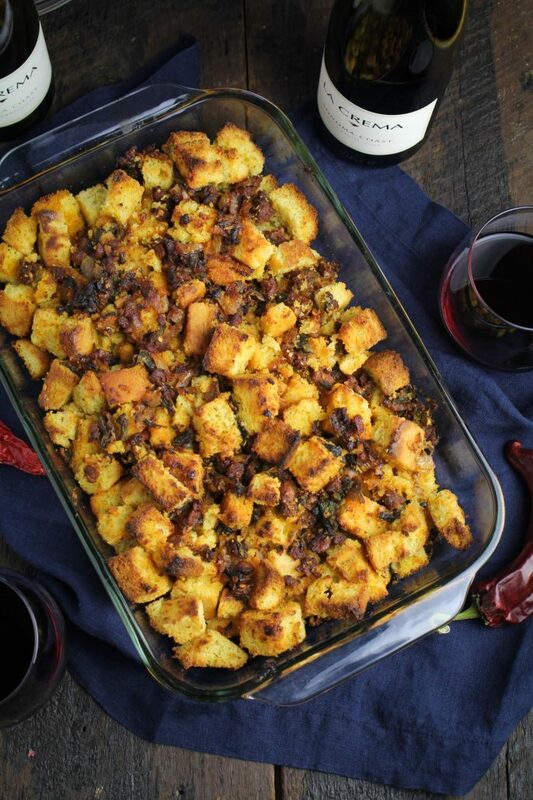 Like the other recipes in this menu, this Cornbread, Chorizo, Poblano Stuffing pairs well with La Crema’s Sonoma Coast Pinot Noir and Sonoma Coast Chardonnay. Classic cornbread-based stuffing gets a little spicy with the addition of chorizo sausage and roasted poblano peppers. Preheat the oven to 400 degrees F. Cut the cornbread into 1 inch cubes and spread out in a single layer on a baking sheet. Bake the cornbread cubes until just toasted on the edges, about 10 minutes. Remove from the oven and set aside. Rub the poblano peppers with 1 TBS of the olive oil. Place on a foil-lined baking sheet and roast until blistered all over, about 30 minutes. Use tongs to turn the poblano peppers every 10-15 minutes. Once roasted, place the peppers in a bowl and cover the bowl tightly with plastic wrap. Let peppers stand for 15 minutes, then rub or peel off the skins. Discard the skins. Remove the stems and seeds from the peppers and discard, then chop the pepper flesh into very small pieces. Set aside. In a large skillet, heat the remaining 1 TBS of olive oil over medium heat. Add the chorizo sausage to the pan, using a wooden spoon to break the sausage up into small pieces. Cook the sausage until browned all over, stirring frequently, about 8-10 minutes. Add the diced onion to the pan with the sausage and saute until soft and translucent, about 5-7 minutes. Add the minced oregano and sage and cook another 2-3 minutes, then remove from the heat and set aside. In a small bowl, whisk together the eggs, chicken stock, and melted butter until evenly combined. Add the toasted cornbread cubes, the roasted poblano pieces, and the sausage and onion mixture to a 9×13 inch pan. Stir to mix together evenly. Pour the egg mixture over the top of the cornbread mixture and stir to coat the cornbread with the liquid. Place in the oven and bake until the top of the stuffing is browned and the liquid is set, about 25-30 minutes. Remove from the oven and serve immediately.